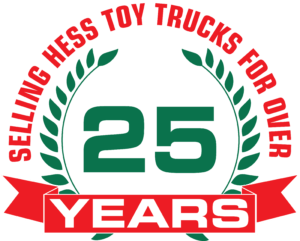 First in the series of Hess collectibles the truck measures approximately 12″ in length. Complete with truck, box, hose, rare insert card, funnel with holder, battery card & insert card. Truck – Mint / Box – 9.85 Condition. This truck is designed after the B-Mack tanker and is painted the old company colors of dark green and white with bright yellow accents. It was manufactured by the Marx Toy Company and is designed to be filled with water from the top with the small funnel and then drained from the hose beneath the tanker. It measures approximately 12 inches in length with all original decals present and in mint condition. All the lights have been tested and are in working order. The top of the box is in excellent condition, all corners strong with only a 1″ repair area on the one end (see pics). The bottom of the box is also in excellent condition (see pics). Truck is in mint condition with all decals present. (see pics). The set is complete with truck, box, packing tissue, funnel with holder, battery card & rare insert card.